TRADE FAIR (GB) (Bay 2000-Stud 2006). 5 wins-1 at 2, Curragh Minstrel S., Gr.3. Sire of 428 rnrs, 255 wnrs, 11 SW, inc. Trade Storm (Woodbine Mile S., Gr.1), Plantagenet, Al Rep - Packing Whiz (H.K. ), Fuchsia Bandana, Moonstone Magic, Miss Starlight, Tradesman, Proceedwithcaution, Tarquinn Shadow, Cool Trade, Nameitwhatyoulike, SP Django, Yaloginda, Trading Day, Absolute Pleasure, Fair Trade, Otro Gintonic, Krakka Vision, Milly's Gift, etc. Django (g. by Trade Fair). 7 wins. See below. Sheihallion (g. by Old Spice). 8 wins at 1200m, 1400m, A$152,065, WATC Hydroflight H., Selangor Turf Club H., Flying Colours Restaurant H., Young Filipino H., No Equal H., 2d WATC Fairetha H., Enjoy Healthy Living H., Original Sin H., Quadripendante H., 3d WATC 96FM Perth's Best Music H., Provincial Championship Series Final H., Cheeky Trot H., Heroicity H., Paris Prince H.
True Laser (g. by Euclase). 2 wins at 1200m, 3d WATC Century God H.
True Price (f. by Pricelessly). Winner at 1200m in Aust. Saxon Lord (g. by Saxon). Placed in Aust. Cold Hard Truth (f. by Verglas). Placed in Aust. The Gospel Sin. 2 wins at 1100m, 1200m to 2017-18, 2d WATC Glenroy Chaff Premium Hay H.
Thai Baht. 2 wins at 1300m, 1400m in 2018 in Malaysia. FANESO (Jevington). 9 wins at 1200m, 1400m, A$97,125, WATC Roma Cup, Gr.3, Swan Dry Welter H., Chefgas Cooker Welter H., EATS Gold Anniversary Welter H., Emu Export H., Balmoral H., DBR Computer Systems H., 2d WATC Roma Cup, Gr.3, TPI Welter H., Midwinter Sprint H., 3d WATC TPI Welter H., Maniana Quality S.H., Waylen Welter H., NEC Hi-Fi H.
Fairpak (Haulpak). 3 wins-2 at 2-at 1000m, 1200m, WATC RAAF Base Pearce P, Maikai H., 2d WATC Placid Ark S., L, Emu 2 2 H., Lilyveil H., Keith Gollan H., Florida H.
Ansoleta. Winner at 1400m, 3d WATC Camperdown H.
JEVANSO (Jevington). 4 wins at 2, WATC Lindsay Rosenthal S., L, Retravision Country Dealers H., Waratah Quality S., Rivose Quality S.
Ansofair. 8 wins. See above. Late Payment. 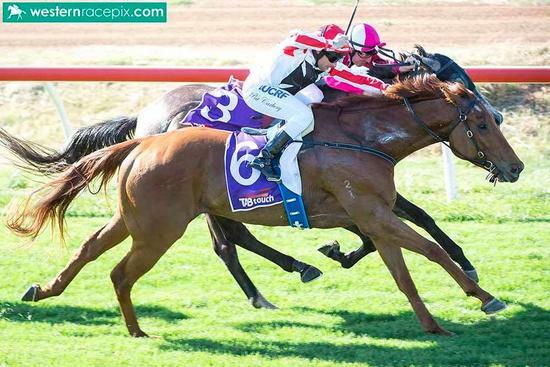 2 wins at 1700m, 1800m in Aust. Ansogay. Winner at 1150m in Aust. Byford Lass. 3 wins from 1200m to 1600m in Aust. King Saba. Winner at 1200m in Aust. Totem Man. Placed in Aust. Boot Legger. Placed in Aust. Modasta. 3 wins from 6½f to 10½f, WATC Waterview H., Westbury H.
Moderation. 3 wins. See above. Race Record: 41 Starts 7-3-6 A$370,175. 7 wins-2 at 2-from 1000m to 1600m, A$370,175, WATC Nominate Yearling Purchases for Westpeed 2YO P., Westspeed 3YO H., Westspeed 2YO P., James Boag's Sprint H., Carnivale at Crown H., Perth Cup Hospitality H., York Cup, 2d WATC Carbine Club of WA S., L, Perth Cup Raceday H., Young Membership 2016/17 H., 3d WATC AJ Scahill S., Gr.3, Seacorp H., Penfolds H., Westspeed H., Perth Cup Raceday H., 4th WATC Karrakatta P., Gr.2.